These businesses are built on a three-legged stool, and that stool is wobbling pretty badly right now. Since May 1, On Deck Capital (NYSE:ONDK) lost 38% of its market value. 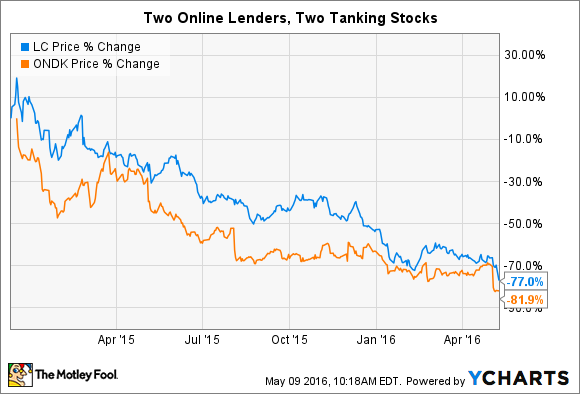 The fall has come fast and furious, trickling over to other online lenders like Lending Club (NYSE:LC) whose stock was down 10% over the same period before absolutely tanking 20%+ immediately following the company's first quarter earnings release on May 9. Combined, the two companies have lost over $1.3 billion in market value since April 27. To make sense of this disaster, here's a breakdown of the specific events that prompted the sell-off and my analysis of why the problems go far beyond a single bad quarter. On Deck's first quarter earnings showed a loss of $0.13 per share, wider than the $0.07 per share loss Wall Street expected. In dollar terms, On Deck lost over $13 million in the quarter, widening its 2015 first quarter's $5 million loss. Worse yet, revenue missed by 11% and the company lowered its guidance for loan originations on its platform by 10% for the year. Lending Club's quarter was not nearly the disaster as On Deck's in financial terms, but its stock crash came no less severely on Monday morning. The market ignored the company's revenue and earnings, both of which either matched or beat Wall Street expectations, and sold the stock on the announcement that the board was firing CEO Renaud Laplanche. Laplanche's unexpected exit came after the company sold a $22 million basket of loans to an investor with very specific requirements of the loans being purchased. Due to a failure in internal controls, the loans did not meet the investor's explicit requirements, a fact that wasn't discovered until after the sale was complete. The board called this failure a "a violation of the company's business practices along with a lack of full disclosure during the review." Laplanche and three other senior managers were promptly shown the door. You may be thinking that a single $22 million security is peanuts to a lender with operating revenue north of $150 million, hardly justification for firing the CEO and three of his lieutenants. In financial terms, you'd be correct. However, this failure touches on one of the core problems facing online marketplace lenders, prompting the board's strong and swift reaction. We'll get to those problems one by one a little bit below. This month's short term problems continue a longer term trend. Taking a step back, On Deck's first quarter results are just another bad break on a year-long decline. The stock is down 82% since it IPO'd in December of 2014. Lending Club's stock is on a similar track. Prior to the IPO, On Deck, LendingClub, Prosper, and other online lenders were hyped as the next evolution of banking, poised to take significant market share from old fashioned, regulation-addled banks. It was only after the IPOs that the market began to question each's business model. On Deck's model is a good representation of the basics. The company accepts loan applications on their website and funds the approved loans with their own capital or through pre-arranged credit facilities provided by large banks. Other lenders may fund the loans with a peer-to-peer model, courting retail investors in addition to other sources. On Deck, which specializes in business loans, would keep some of the loans on its books as earning assets and sell others to investors on the secondary market. The loans sold on the secondary markets often came with a premium, juicing the profit potential even further. Those sales also returned cash to the company, providing funding for even more loans. This model hinges on three key concepts, all of which are driving major problems for each of these stocks. If we think of these companies as a three-legged stool, the problems with each leg are causing the instability we see in the market right now. There are other challenges, of course, but without these three nothing else matters. The only way this niche will find stability and long term success is by standing securely on all three legs. First, On Deck, Lending Club, and others must grow, and they must grow quickly. On Deck's IPO valuation was well above 15 times its book value, an extremely rich multiple that underlies the market's expectation for rapid growth. The company has not been able to delivery on that growth, as seen in its revenue miss for the first quarter and a reduction in loan volume guidance for the year. Previous guidance showed On Deck increasing loan originations 45-50% year-over-year. Investors were told this month to only expect 30-35% growth instead. With growth decelerating, investors have appropriately brought the stock's valuation multiples back down to earth. The second and third legs of the stool are highly interrelated. Lending Club and On Deck must originate predictable, risk appropriate loans, and they must ensure that their partners on the secondary market are happy with their investments and come back for more. On Deck, Lending Club, et al must originate loans of a high and consistent enough credit quality that the investors buying the loans on the secondary market can be reasonably assured their investments will provide an appropriate risk-adjusted return. Further, the secondary market investors must be confident that the securities they are buying conform to the prospectus provided by On Deck, Lending Club, or another online lender. In other words, if the documentation says the basket of loans is top quality, that basket of loans better be top quality. For example, say that On Deck or Lending Club hypothetically sold a basket of loans to an investor with an expected default rate of 0.5%. The secondary market investor would price this security on the assumption that its yield and risk profile were accurate. If, however, the loans defaulted at a materially higher rate, say 5%+, the investor would take a big loss on the investment. That's not good. If that happened several times, the secondary market for these loans could very well dry up, leaving our online platform with no market to sell their loans. On the first quarter conference call, On Deck's management explained the quarter's reduced loan volume as a result of tightening credit standards. That may at first seem reassuring, but it also implies that prior credit standards were too lax. Eyebrows raised even farther when management announced that only 15-25% of originations would be sold on the secondary market instead of the previous plan to sell 35-45%. Could poor credit quality and disappointed secondary market investors have prompted this change? It seems plausible to me. In Lending Club's case, firing the CEO over a relatively small $22 million security is much more about managing relationships with secondary market investors than it is about the financial impact of that botched transaction. If Lending Club is selling securities to investors that don't match what the investor signed up to buy, that's a huge problem for the third-leg of the stool. If those investors were to walk away, the company would lose its ability to profit from those loan sales and disrupt its ability to keep cash flow moving to fund their growth. Again, that would be a huge problem. The problems are not just On Deck and Lending Club's to bear either. News broke in April that Citigroup (NYSE:C) had ended its relationship with Prosper, another large but privately owned online marketplace. Citigroup had been the company's capital partner, helping Prosper to package and sell the baskets of loans from the Prosper platform. The move came after Moody's put several tranches of Prosper securities on review for downgrade earlier this year, citing loan charge offs at a higher rate than expected. With credit quality in question and Citigroup walking away, Prosper's three-legged stool doesn't look like the most stable place to sit an equity investment right now either. Where do these niche companies go from here? To me, the problems facing these lenders today can be overcome. As start-ups, the companies prioritized growth above all else to appease their venture capital backers and reach scale. But growth is just one of the three essential concepts that these companies need to master to succeed. Now, as public companies, it's time for them to grow up. That means prioritizing the other two legs of the stool -- risk management and capital partner relationships. Lending Club's leadership shake-up was the right thing to do. The company needs leaders with experience not just in high-growth start-ups, but in banking, risk management, and operations. On Deck must find a way to balance credit quality with growth. The company needs both and is succeeding in neither. These challenges can be overcome. Traditional banks have been doing it for centuries. But the online marketplace is a new concept, and we don't yet know how the business will have to adapt, change, and evolve to balance all three legs for the long term. In my view, only the most risk tolerant investors should consider these stocks today. There are the significant challenges discussed above, and then there's the other elephant in the room. These companies have only ever existed during periods of credit expansion. The next recession and credit contraction, whenever it comes, will be the real test of their mettle.